Studies show long term survival and cure are possible when breast malignancies are detected and treated at an early stage. Studies also show that yearly mammograms are effective in detecting breast cancers at an early stage in most women. 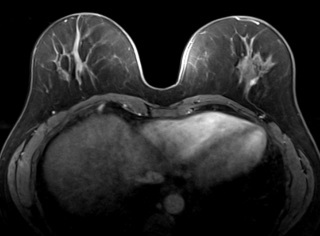 Importantly, studies show specialized breast radiologists who read only mammograms find more cancers, more cancers at earlier stages, and recommend fewer unnecessary biopsies, all of which contribute to improved care at all steps along the way—from diagnosis with fewer biopsies, through comprehensive care with earlier stage diagnoses requiring less extensive, disfiguring, and costly treatment, to improved survival and cure. Dr. Katherine M. Cyran is a clinical breast imaging expert with over 15 years of experience dedicated to breast and only breast. She is specialty trained and continually educated in comprehensive breast care including clinical evaluation, risk assessment, breast imaging, diagnosis, consultation, and management. At the Katherine M. Cyran MD Breast Center, we recognize that breast cancer is a significant fear for most women. We know women desire expertise and will seek a caregiver who provides them with comfort and confidence that their concerns are being fully addressed and monitored. We understand that "not knowing" is the most anxiety provoking aspect of the breast care process. In short, women want to know they are being cared for by a person who is exceptionally skilled, and they want to know what is going on. Dr. Cyran offers unique face to face hands-on patient interaction through detailed history and physical examinations, performing her own breast ultrasound examinations, and thorough discussion of results and management recommendations of diagnostic examinations. Streamlined continuity of care from screening through biopsy in one location by one physician ensures patients that there will be no gap in their care and no chance for findings to be overlooked through multiple radiologists at a variety of sites, their biopsy will be performed by the same physician at the same location with which they are already familiar, and their time to knowing their diagnosis will be minimized. Studies show yearly mammograms are effective in detecting breast cancers at an early stage in most women. Current guidelines for women of average lifetime risk (<15%) recommend yearly mammograms beginning at age 40 and continuing until no longer in good health. However, some women, based on personal and family history characteristics are at greater than average risk of developing breast cancer in their lifetime. 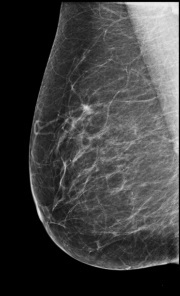 Current guidelines for women of increased lifetime risk (>20%) recommend yearly screening with breast MRI in addition to yearly mammograms. Women with an increased 5 year risk are candidates for risk reducing medicines. Current guidelines for women with highest lifetime risk (up to 80%) because of a BRCA 1 or 2 gene mutation include either increased, enhanced screening with or without risk reducing medicines, and/or preventative surgeries. At The Katherine M. Cyran M.D. Breast Center, every woman undergoing screening or diagnostic mammography can receive a complementary combination 5year, lifetime, and BRCA 1,2 risk assessment. Specific screening and other management recommendations based on their personal risk are then shared with them and their physician by letter or in person. Coordination of care can be provided for women at high 5-year and lifetime risk including assistance in scheduling yearly breast MRI and referral for discussion regarding use of risk reducing medicines. In-office genetic counseling, testing, and results discussion is available on site for women at risk for BRCA 1, 2 gene mutation (see below) and appropriate management discussion and care coordination can be provided as necessary. Earlier Detection Saves More Lives! Women with BRCA 1 or 2 gene mutations are at highest risk for developing breast cancer (lifetime risk is up to 80%). Breast cancers in these women are often aggressive and more likely to be diagnosed at a late stage. These women are also at high risk for advanced ovarian cancer. Most women do not know if they carry a BRCA gene mutation and undergo yearly mammography. But, studies show that yearly mammograms have reduced effectiveness in women with BRCA gene mutations– less than 50% chance of detecting early cancers! 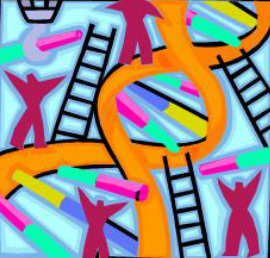 Identifying the presence of a gene mutation before cancer develops is possible, and provides individuals the chance to reduce or even eliminate the risk of cancer before it devlops. Furthermore, this abnormal gene is passed along in family lines— there is a 50-50 chance siblings and children of affected individuals also have this abnormal gene, putting them at the same risk. Identifying one individual opens the door to identifying other family members who can also take steps to reduce or eliminate their risk. All patients undergoing mammography at The Katherine M. Cyran MD Breast Center are offered screening for red flags that may indicate BRCA 1,2 gene mutation risk. Counseling and testing, a simple “swish and spit” covered by most insurances, is available for those at risk. Studies show breast cancer risk may be reduced through ideal weight maintenance, moderate regular exercise, and appropriate nutritional considerations. At the Katherine M. Cyran M.D Breast Center women will have the opportunity to address and discuss lifestyle choices and modifications which may contribute to decreased breast cancer risk. A registered dietician is a phone call away and opportunities abound for individual or group exercise. A "prescription for breast health" is available for all.